Bagnères-de-Luchon, also known simply as Luchon, is a pretty tourist town just a few kilometers from Spain. It’s famous for its thermal baths, and yes, I did try them. Although many of the streets in town have crappy surfaces, many of them are lined with beautiful grand buildings, much more grand than in any other French mountain village I’ve seen. Many, perhaps most, of the big climbs in France have cycling kilometer markers which show the distance left to the top, and the average gradient of the next kilometer. Well, the climbs around Luchon don’t. The ones I rode have a marker to mark the start of the climb (sometimes in a seemingly arbitrary place), and a second one 3 km from the top. That’s it. By the time I arrived in Luchon I was suffering from very painful urination. I saw a doctor (the nearest hospital is in Saint-Gaudens, about 45 minutes away by car) who prescribed antibiotics and told me to stay off my bicycle (prostatitis is aggravated by cycling.) I said I was only here for the cycling so he thought about it and said stay off the bicycle for 3 days. Well, that didn’t help. I decided the issue with cycling is that you are sitting on the saddle, so I would do all the rides standing. I had hoped to do more cycling in the area but restricted myself to these three rides, by which time my quads were seriously in shock. From Luchon you have the big climb to Superbagnères, the cute little Col du Portillon, the Col de Peyresourde with its lovely finishing switchbacks, and the magnificent Port de Balès. Perhaps the most famous climb out of Luchon, it’s been a stage finish several times in the Tour de France. The first two thirds are nothing special, riding mainly in the trees, but the last third is fantastic, with spectacular views of the mountains. The whole climb is 16.75 km with 1,123 meters 3,684′) of climbing. Start at the south end of Luchon, at the intersection where the D618-A turns left and heads to Spain and the Col du Portillon, and the D125 heads up to Superbagnères. At km 4.4 turn right following the signs (going left takes you to the Hospice de France, which I assumed was a beautiful place for terminally ill people, but no, it’s just a hotel and restaurant.) You now see a sign indicating the start of the climb to Superbagnères. What? I’ve just climbed 4.4 km, admittedly some of it relatively flat, but still. Keep climbing then at km 8 the road forks and you follow the switchback round to the right. Keep climbing and eventually you get up above the trees and into incredible open terrain with spectacular views. Another 5 km and you reach the gravelly parking lot beside the huge hotel building at Superbagnères. A cute little climb, very varied gradient, no great views, some nice switchbacks, and a couple of sections that touch 14%. The climb is not a great climb but it does have a certain charm. The whole climb is 8.75 km with 623 meters (2,044′) of climbing. Start at the south end of Luchon, at the intersection where the D618-A turns left and heads to Spain and the Col du Portillon, and the D125 heads up to Superbagnères. After a few hundred meters turn right following the signs. 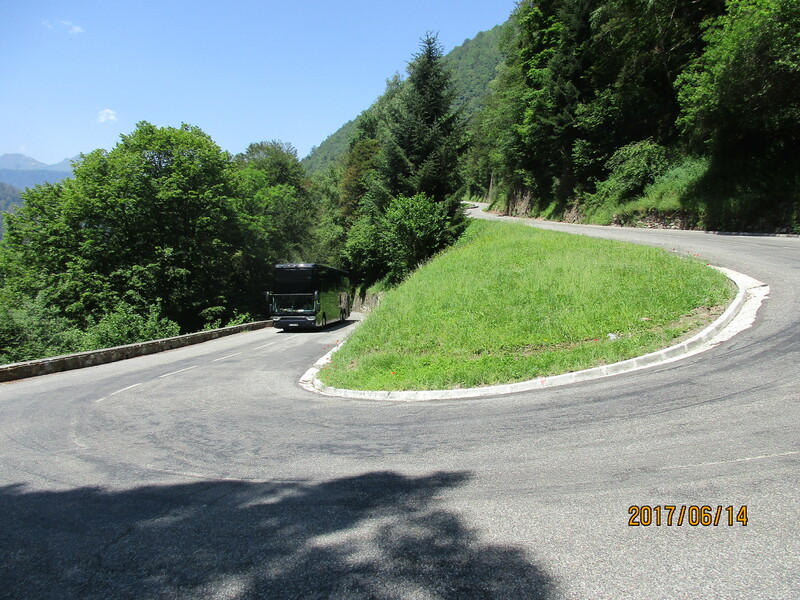 Just before km 4, after some nice switchbacks, the road rears up for a few hundred meters and the gradient reaches 14%. The road then flattens out for a way, then just before km 8, it again rears up and briefly touches 12%. Fortunately this section is not as steep or sustained as the previous section. Another few sweet switchbacks lead to the top and Spain. The other side is a climb of 8.2 km which reaches a maximum gradient of 17.8% according to a sign at the top of the Spanish side. I drove down this on my way to Andorra and it appears to be a much better climb than from the French side, with a lovely road surface. Someday. Port de Balès from Luchon is my second favorite climb around Luchon. 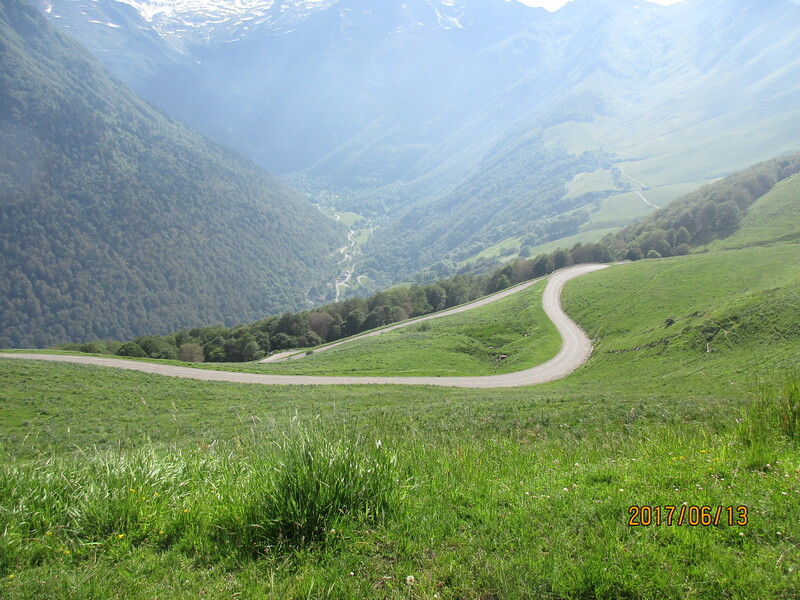 I’d ridden Port de Balès from Mauléon-Barousse in 2008 and the descent into Luchon was fantastic. I wondered what it would be like to climb it. Well, it’s fantastic. Never too steep, it’s varied, peaceful, beautiful. Something about it resonates with my soul. But anyway. The whole climb is 19.3 km with 1,117 meters (3,665′) of climbing. Start in the center of Luchon by the church and the memorial to those who died in the wars. Head west and in 1.3 km turn left onto the rather busy D618. At km 3.6 you climb two switchbacks then turn right on the D51, signed to Port de Balès. The climb varies in gradient as you wander through several cute little villages. Finally at the village of Bourg-d’Oueil, turn very sharply right. At this point you see a sign indicating this is the start of the climb. What? You now have just under 6 km left. 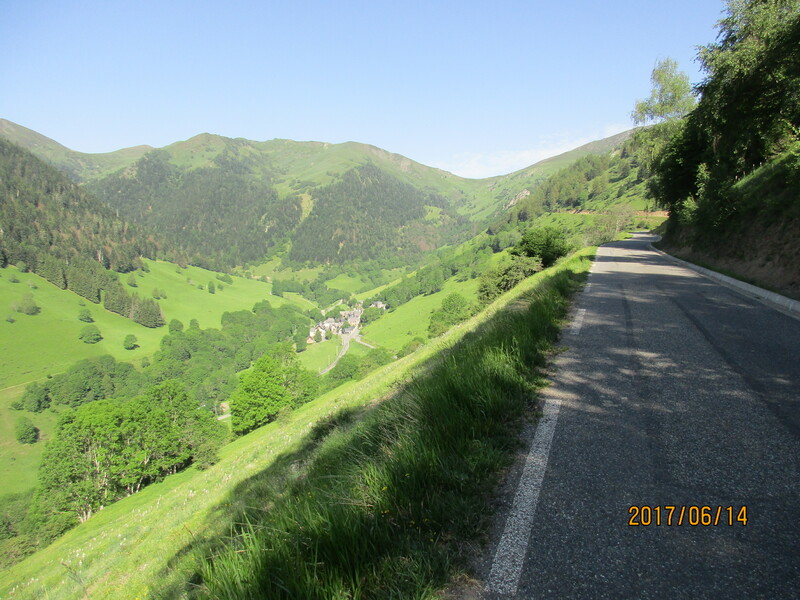 The whole section between the D618 and Bourg-d’Oueil is magical, and now it gets even better as the road slashes across the hillside then winds back and around before reaching the top. So if this is my second favorite climb, what is my first? The north side of the Port de Balès, which is wilder and even more beautiful. I’d ridden that side in 2011 and hoped to ride both sides as an over-and-back this trip. But I couldn’t face another long standing climb immediately after this one.